Shandong Yucheng Tianming Machinery Co., Ltd. The rotary tiller is adopted middle gear transmission system, mounted with the tractor of 12-80hp. Tractor wheel tracks are completely covered after tillage as the working width is much wider. The quality is reliable and the performance is well. So it can be used on dry and paddy field. It can reduce the time, laboring, and cost, etc. during operation. 1) this implement can be matched with the back power output tractors, and crush the clods by the rotary and walking movements of blades. Its feature is the strong crushing capacity of clods, once cultivation can reach the effect of several workings of a common plough. 2)this implement mainly works in the sand loam, loam soil, light clay and the dry field with the absolute moisture content of 15%-25%, has multiple functions, as tillage, stubble pulverizing and burying, weeding, turning mud, tamping, ridging, fertilizing and leveling land, and also can be used in the paddy field tillage. 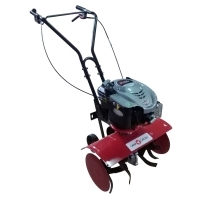 3)1gqn series rotary cultivator is adopted middle gear transmission system, mounted with the tractor of 18-80hp , reliable quality and good performance, safe time and efforts, high quality with low cost. Qingdao Granmac Agricultural Machinery Co.,Ltd. Short on time? Let rotary-tiller sellers contact you. JK Rotavator is the latest concept in agriculture mechanization and it helps the farmer to increase the productivity drastically compared to conventional Equipmentâ? ?s / manual work. JK Rotavator is one of the most suitable machine for large & medium farmers and removal of sugarcane stubble, rice, potato, wheat, cotton, banana, grass, vegetables etc. it retains growth of crops to give you the best yield and profit. JK Rotavator can be used in dry and wet paddy condition for pudding and to tilt soil finely incorporation every kind of crops residue in to soil and improve the organic structure of the soil. JK Rotavators are manufactured under the supervision of skilled engineers. JK Rotavators are designed specially with interchangeable gear and chain. Size: 3.50-6-4PR, 3.50-8-4PR Pattern: R-1 Section Width: 85,95mm Overall Diameter: 340, 385mm Scope of application: micro-farming machine, power tiller, rice transplanting machine, mower, small farm machinery, etc. Jinxi Metal Product Co. Ltd.
We are the leading manufacturer and Exporter Company for agriculture machineries in Punjab / India. We export our machineries in different countries. Our product Rotary Tiller is the best one from our exports products. For details please contact us. HTL-125 Model	SPECIFICATIONS	HTL-135 Model	SPECIFICATIONS Suited to: 20 - 35hp Tractors Suited to: 30 - 45hp Tractors 3-Point Linkage: Cat.1 3-Point Linkage: Cat.1 Length: 770mm Length: 770mm Width: 1480mm Width: 1570mm Height: 970mm Height: 970mm Weight: 285kg Weight: 300kg Gearbox: 35hp Gearbox: 50hp Digging Width: 1250mm Digging Width: 1350mm Digging Depth (max. ): 180mm Digging Depth (max. ): 180mm Blades Per Flange: 6 Blades Per Flange: 6 Adjustable Skids: Yes Adjustable Skids: Yes Rear Flap: Height Adjustable Rear Flap: Height Adjustable HTL-150 Model	SPECIFICATIONS	HTL-180 Model	SPECIFICATIONS Suited to: 35 - 50hp Tractors Suited to: 35 - 55hp Tractors 3-Point Linkage: Cat.1 3-Point Linkage: Cat.1 Length: 770mm Length: 800mm Width: 1720mm Width: 2020mm Height: 970mm Height: 1070mm Weight: 320kg Weight: 370kg Gearbox: 50hp Gearbox: 50hp Digging Width: 1500mm Digging Width: 1800mm Digging Depth (max. ): 180mm Digging Depth (max. ): 180mm Blades Per Flange: 6 Blades Per Flange: 6 Adjustable Skids: Yes Adjustable Skids: Yes Rear Flap: Height Adjustable	Rear Flap: Height Adjustable. 2.05X0.80X0.72Meter; 42units/40ft. Prepare rich mixture of grass, excess useless crop material & land which act as a natural fertilizer for next seed bed in only one pass. Salient Features : Positive drive system with hard & ground gears can be used in any kind of wet Paddy or dry condition, to cultivate and at the same time assisting the tractor in muddy conditions. It most suitable for sugarcane stubble removal. Variable speed oil bath ,machined gear box. Five lips oil seals with dust cover. Spring loaded adjustable trailing board. PTO shaft with shear bolt system. Depth of cultivation can be adjusted very easily. In wodden box. Size: 4.00-7-6PR, 4.00-8-6PR Pattern: R-1 Section Width: 110mm Overall Diameter: 390, 435mm Scope of application: walking tractor, micro-farming machine, power tiller, rice transplanting machine, mower, small farm machinery, etc.